Since my last blog, Team Fine Fettle have been working hard at local events. Early on Sunday 5th September, the “Team” set off to set up for the Badger Half Marathon which started in Leatherhead and then over the beautiful countryside of Norbury Park and back to the start. An early start to set up the couches, and then a wait for the first runners to come in. The first runner Tim Elsey came home first in a new course record of 1.15.17. In the ladies race Rose Nicholson from Woking AC stormed to victory in an excellent 1.25.28. Mel Healy, Joss Hudspith, Caroline Adderly and Helen Bullen where the therapists on the day and had their work cut out with almost two hours of solid post-event massage and injury support, once the main body of runners came across the finishing line. A hard morning with many tired runners as the course was a hilly one. We raised over £80 for the Rainbow Trust Charity. 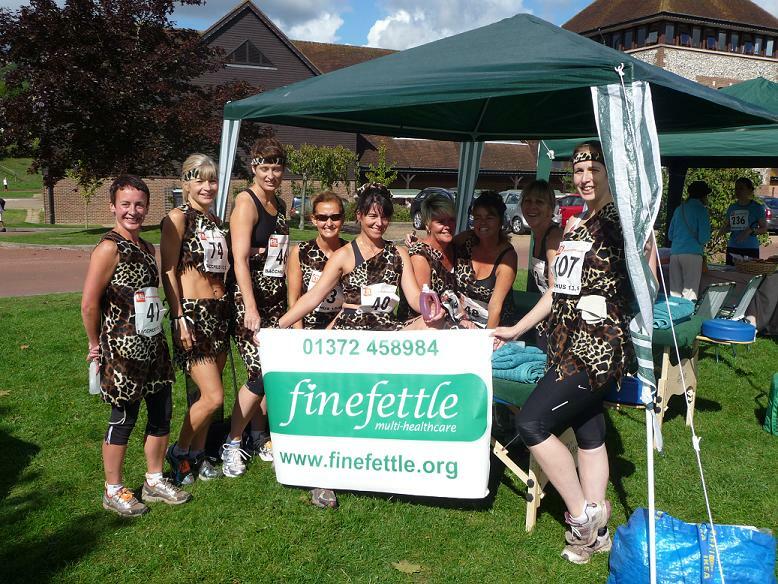 Last Sunday saw the Fine Fettle Team out again at the Bacchus Half and Full Marathon event. This was the first time it had been run and the emphasis was on fun, as runners were encouraged to don fancy dress and sample wine en route. 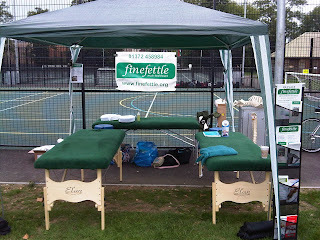 Team Fine Fettle were once again manning the massage and injury support area and, much to my better judgement, I was actually doing the half marathon. Not only did I agree to run it, but somewhere along the line I decided with some friends it would be good fun to dress up and all run it together. This meant 9 cave girls on the run!!! ﻿As I have a group of friends who are keen runners there were only two cave girls who had never run beyond 10 miles before with many of us marathon finishers at some point in our running careers. We all decided to run together and rebanded at every drinks stop for Jelly Babies and a snifter of wine!!! We then all ran on together... With the stops, singing and mucking about, we finally came home in just under 2hrs 30. A nice time to take time to enjoy the race and the surroundings. I do think we did surprise a few runners as being the largest group in fancy dress initially runners wanted to get in front of us… We are not a bad group of runners so it was fun to catch a few unawares and get back in front on the big hills!!! Our finish was somewhat noisy and we think may have been heard in Dorking….lots of singing and whooping – we seem to have made many websites and papers since!!! Jan working out how not to get too “blue” on the day!! Had Jan now become an Avatar too?? 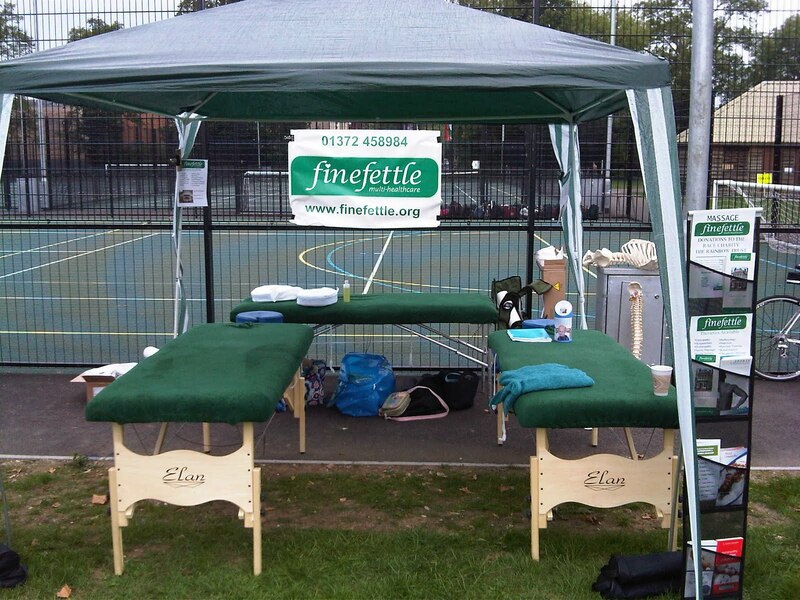 Team Fine Fettle once again was a roaring success and with the expertise of both Osteopathy and Sports Therapy, and provided a full-on service for all the post-event runners. Once again, they raised money for the race charity – Chase and raised over £160 on the day. Next event for Team Fine Fettle is the Queen Elizabeth Foundation Bikeathon on Sunday 26th September. We're looking forward to it as Mel Healy is taking the warm-up and seems to think we will all be doing it with her????!! !